That looks fabulous! I love the chunky frame and your work on the picture looks great! I'm sure they will absolutely love it. Did you take the picture or did you play with a stock image? I love it! That will mean more to her then any purchased gift and it's absolutely beautiful. 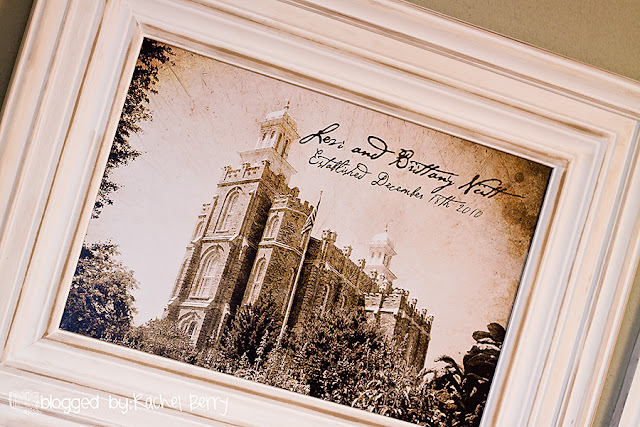 another neat twist would be to make one with a picture of the church the couple is marrying in (assuming it's a church wedding)! Rachel you did a beautiful job on this! I'm partial to the Logan Temple since I get to see this amazing view everyday but having it personalized will make it even more treasured for years to come! Merry Christmas! Rachel, that looks awesome!! 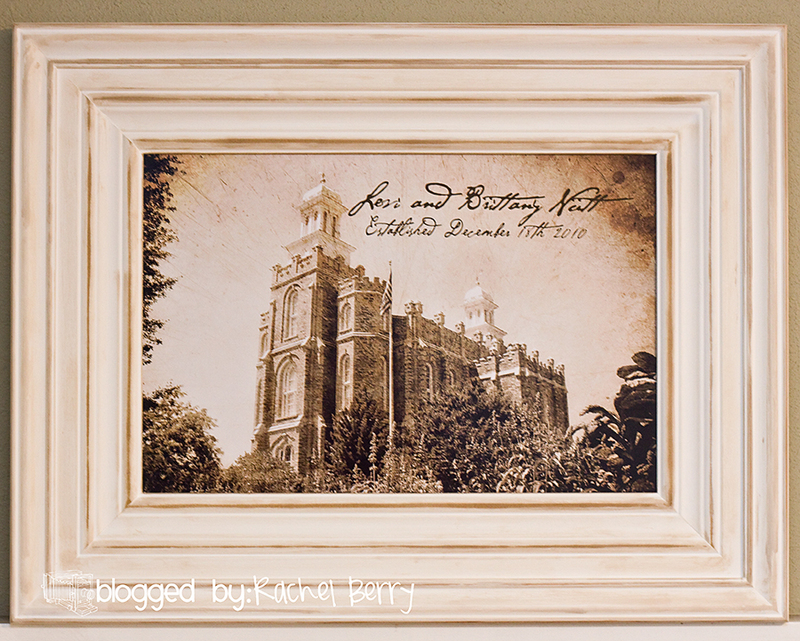 Can I put my order in for the Portland temple? :) I love it! Wow! That is awesome!! I'm really really inspired! Honestly I love this more then the ones that you can buy because you completely personalized it! Great job! What font did you use? I love love love it. Thanks so much for showing your fun projects. For the name I used Hannibal Lecter. For the date I'm pretty sure I used Texas Hero. Both, I'm sure I found free via the web..
Good grief! You are amazing. My brother just got married and I still have not given them a gift. Can I pay you to make a jpg picture of the Arizona temple? I've never left a comment before, but this deserves a comment! In our ward a guy was just baptized and was talking about going to the church bookstore here in California to get some things. I stopped him right there (not that I don't want to support the local sales guy) but you can't be paying $300 for scriptures that really cost $30. We helped him out, but seriously... why are Mormon bookstores SO expensive?! You know we're all a bunch of cheap skates! Who buys that stuff? Alright, what I'm really trying to say is fantastic job and thanks for the inspiration! I really like that! It looks fabulous! LOVE the frame! Great job! Is their last name Nott? That is my grandparent's last name, don't see it much! That is so so awesome!! Great job and thanks for the inspiration!! etsy? Bet you could sell that baby! Just had to come back to look at this again. Yep, you need to sell these. I know that would be work for you, but I just don't think if I did that it would come out as well! I want one of these with MY temple and MY date and name on it!!!! Wow, you're brilliant! I am inspired to try my own . . . some day! It turned out so awesome! Thanks for being there. Brit said you got some good pictures after the luncheon. Can't wait to see them! Was hoping to get a family pic but I guess that will come later. Its beautiful! Great job you are so talented! WHat a good idea! I'm going to copy that idea for a picture I've been wanting to frame! Smart Rachel! That turned out so good! Oh my heck! I love that! I have been looking at the rexburg one for a while, but it is just too much! How did you nail it all together? I might just give it a try. Thanks for sharing! It really is beautiful! I'm back to see if you are selling these yet. Pretty please. I need one for my husband's office at church. This is fabulous. 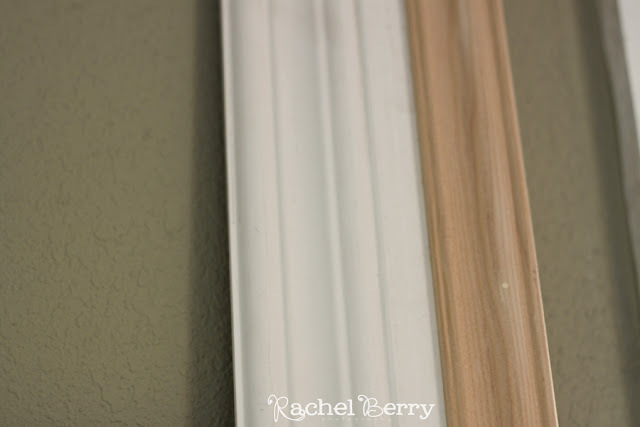 I wish you shared how you adhered the pieces of molding together for the frame. 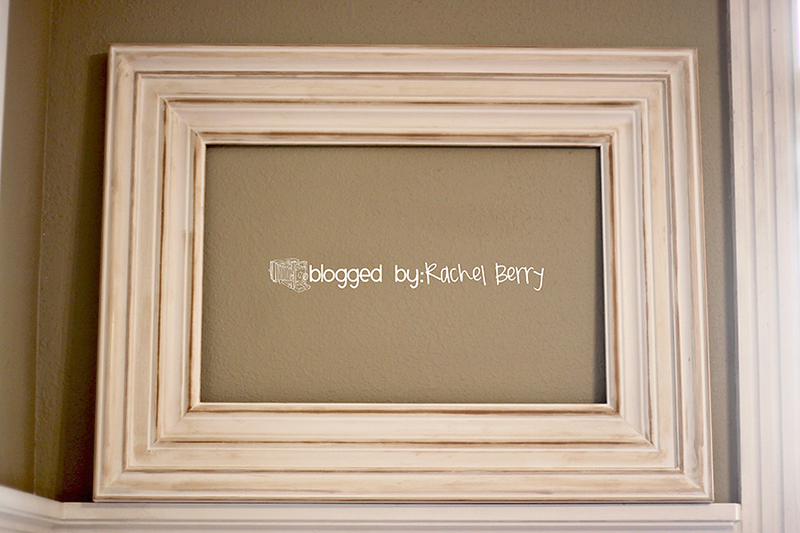 I've been wanting to make my own frames for years but haven't figured out a really secure way to piece the corners together. Found you on interest, bytheway. Can I asked what font you used and where did you find it? I love La Grande my Brother-in-law is from there. Could I pay you to do this to the San Diego Temple in photoshop? If you tell me the font, I could add it to it. Thanks for any help you can give. A tutorial perhaps? Many Thanks, I LOVE IT!!! Oh my heck soooo cute I love it!! I want to make one! 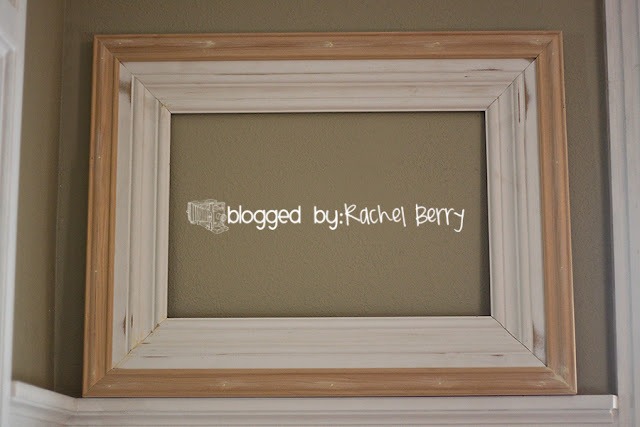 I have a slight addiction with picture frames, its weird! and the weirdest thing happened the other day at church. I saw Brittany at church in my ward on sunday. And I knew I knew her but I didnt know how! I seriously havent seen her for like years and years! But I recognized her face from the family gatherings in LaGrand that we went to when I was like 6...if even that! So now I know that i'm not crazy and I know her and that we are related! I will have to talk to her next sunday! I'm not even sure she would recognize me, but we'll see!